Sorry, couldn’t help myself. I was going to put the SNL skit on here, but figured more people probably hadn’t seen the Haddaway official video. How sweet is this Dracula-turned-Rocky Horror mansion with the quick 90’s zoom-in and zoom-out effect? I’m asking this question because the definition of marriage is up for review here in the US. Legally. My blog is not a political blog- there are times I do rant, for sure, but it’s usually involving the Oregon Ducks. Anyway… my Facebook was blowing up about this today, so I thought I would write something about it, without getting too much into politics. So when I think of marriage- real marriage, not shammy shiz- I think of love. So what is love? Apparently, “What is Love” was the most popular search term on Google for 2012, according to The Guardian. The article also offered up some theories answering this question- What is Love? Philia which they saw as a deep but usually non-sexual intimacy between close friends and family members or as a deep bond forged by soldiers as they fought alongside each other in battle. Ludus describes a more playful affection found in fooling around or flirting. Pragma is the mature love that develops over a long period of time between long-term couples and involves actively practising goodwill, commitment, compromise and understanding. Agape is a more generalised love, it’s not about exclusivity but about love for all of humanity. Philautia is self love, which isn’t as selfish as it sounds. As Aristotle discovered and as any psychotherapist will tell you, in order to care for others you need to be able to care about yourself. Last, and probably least even though it causes the most trouble, eros is about sexual passion and desire. Unless it morphs into philia and/or pragma, eros will burn itself out. To all of these people, love is a multifaceted emotion. It can be described in many ways. No one here describes who is allowed love… other than identifying the roles people play- lover, mother, brother, husband, child, worshipper. 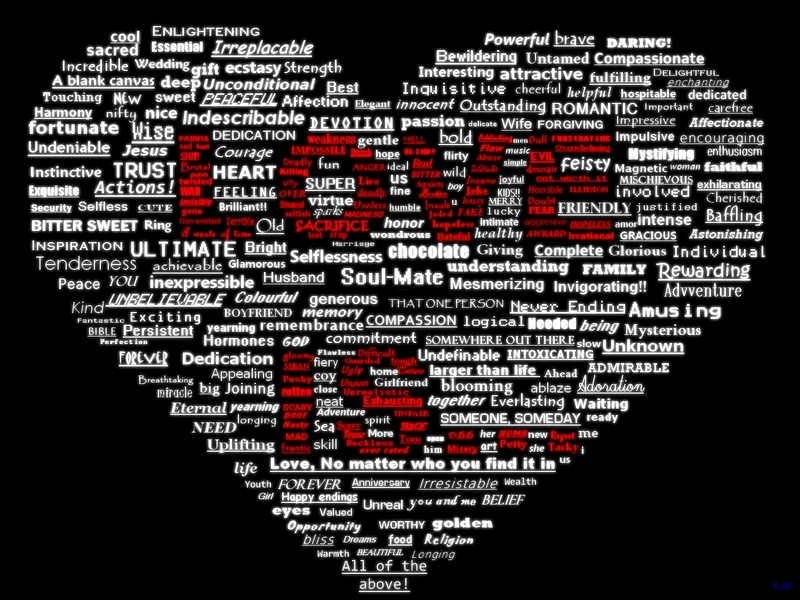 Love isn’t the piece that is legally being defined here… marriage is. As spiritual beings, marriage can be kept within the sanctity of your place of worship etc… but as human beings -on the whole- marriage is ultimately the declaration of love, the legal commitment of love, the recognition of love; and all of those legal consequences of those declarations and commitments. So that is why I bring up love… because the people who are wanting to get married aren’t trying to get a greencard, or golddig or be on the cover of People magazine… they are trying to get married for love. Love is for everyone (now where’s mine, darn it?! Lol). Now shifting a bit here… speaking of love… the dance of love. No, Not Dirty Dancing… not the lambada… the Tango. The Argentinian Tango. So I’m leaving for Argentina tomorrow. I have no expectations and don’t know that much about Argentina… but I will be buying tango shoes, taking tango lessons and exploring. I’ll update you when I get the chance but it may be spotty… in the meantime, love one another. Be excellent to each other. And party on, dudes!